In Sri Lanka, 80 percent of the poor live in rural areas. Poverty to a large extent coincides geographically with the rain-dependent dry zone, which has been subject to prolonged and recent drought. Numerous minor irrigation water reservoirs, called tanks, store seasonal rainfall for agriculture production, animal husbandry, and domestic purposes. In the past, communities have failed to maintain irrigation schemes, which has led to decreased food security. Analysis of socioeconomic and impact of rehabilitated schemes in the Kurunegala District. Therefore, beginning in 2002, the Community Managed Rehabilitation of Minor Irrigation Schemes (MIS) Project was jointly implemented in 17 districts of the dry zone by the United Nations World Food Programme (WFP) and Sri Lanka's Department of Agrarian Development (DAD) of the Ministry of Agriculture. WFP-assisted development projects were approved to increase incomes and employment of the small farmers through improved irrigation and, as a consequence, increased and diversified agricultural production. DAD has implemented GIS to help select tanks that will be rehabilitated in the future and to assess the impact of rehabilitated minor irrigation systems on poor farmer families in WFP activity districts. In addition, GIS is now being utilized not only as a system to monitor the sustainability of the rehabilitation process but also to measure changes in agricultural patterns and the process's impact on the living conditions of the poor farmer families. Through the development of these minor irrigation schemes, farmer groups acquired much-needed water as well as skills in water management and sustainable agricultural practices. DAD intends that the project will cover 660 minor irrigation schemes in eight priority districts by 2006: Anuradhapura, Kurunegala, Puttalam, Matale, Kandy, Moneragala, Badulla, and Ratnapura. DAD is the responsible government department for rehabilitation and maintenance of minor irrigation systems for the entire country. As early as 1998, DAD conducted a comprehensive tank inventory study with 76 attribute fields collected per tank regarding technical aspects, cultivation practices, catchment area characteristics, etc. System updating was then conducted annually. 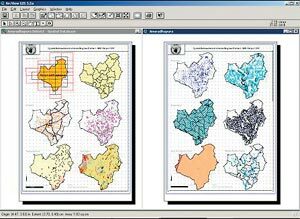 GIS database for the MIS Project. In addition, 52 one-inch to one-mile topographical map sheets covering the entire study area of the MIS project (published during the period from 1977 to 1998 by the Department of Survey, Sri Lanka) needed to be converted for GIS use. 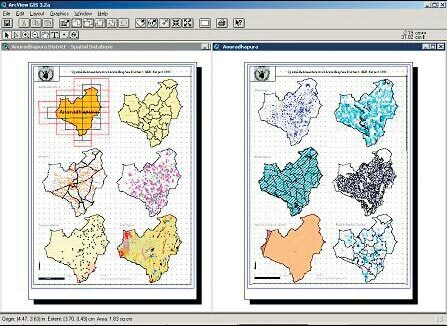 ArcInfo was used for the spatial data conversion by manually digitizing topographical map sheets and then converting data into transverse projection. ArcView was an important management tool for identifying tanks for rehabilitation, monitoring tanks, and evaluating rehabilitated minor irrigation schemes as well as updating the attribute fields on each rehabilitated minor irrigation scheme. Since the topographic map sheets had not been updated after 1998, ArcPad 6 enabled project staff to extract accurate current data within a short time. The identified themes were projected on Mercator projections, and each minor irrigation scheme was linked with the existing tank inventory database based on a unique minor irrigation scheme identification number. In the process, 1,086 minor irrigation schemes that had already been rehabilitated from 1994 to 2001 were identified, demarcated, and separately classified with relevant attributes. In addition to selecting the rehabilitated irrigation schemes, GIS is used to monitor the sustainability of the rehabilitation process. For this purpose, relevant socioeconomic and specific scheme data was collected in all WFP activity districts with the assistance of agriculture, research, and production assistants (ARPAs). ARPAs were trained to collect data for each scheme using an impact evaluation questionnaire. Impact monitoring training programs were conducted continuously in 11 sessions, and 447 minor irrigation schemes were selected for analyzing the impact on the living conditions of the poor farmer families and vast changes of agricultural patterns (cultivated land extents, harvest variations, cropping intensity, and cropping patterns). A significant component of the development and maintenance of any GIS is a staff that is fully aware of the power of GIS. DAD staff had been trained to collect and input primary data. In addition, technical assistants from the eight priority districts and engineers were trained to extract the required data from the system for the MIS project. ArcInfo, ArcView, and ArcPad were demonstrated at the head office and during a series of workshops at district level. Presently, DAD is well equipped with a GTCO A0 size digitizer and a large format HP Designjet color plotter. A Leica GS5+ GPS enables DAD to identify minor irrigation schemes in conflict-affected districts in the northern and southern provinces of Sri Lanka. The next DAD/WFP project is to create a district-level GIS network in four districts (Puttalam, Anuradhapura, Kandy, and Badulla) equipped with ArcView. For more information, contact Ranjani Perera, engineer, WFP Projects, Department of Agrarian Development, Sri Lanka (tel. : 94-11-2691070, e-mail: dadwfp@mail.ewisl.net), or Nadika D. Senadheera, implementing GIS consultant, WFP Project 2000-2003, United Nations World Food Programme, Sri Lanka (tel. : 94-11-2586244, e-mail: WFP.Colombo@wfp.org).